Clare senior hurler Conor McGrath went off injured for Cratloe. Darach Honan (Clonlara) and Cian Lynch (Patrickswell) both clinched county final spots today. 2015 FINALISTS CLONLARA are back in another Clare senior hurling decider after today’s semi-final win as they ended Cratloe’s double dream at Cusack Park in Ennis. Cratloe are involved in next Sunday’s senior football decider against Kilmurry-Ibrickane but lost out 1-18 to 1-16 in this hurling clash with Clonlara now having a chance to atone for last year’s final loss to Sixmilebridge. Clonlara were in front 0-5 to 0-4 after 11 minutes and had increased their advantage to three points – 0-12 to 0-9 – by the interval. A goal for Clonlara from Michael O’Loughlin in the second-half stretched their advantage further. Cratloe cut the deficit through a goal from Conor McGrath but the Clare senior hurler then suffered an injury and was forced off. Clonlara will now face Ballyea in the final and will hope to add to their previous title win in 2008. 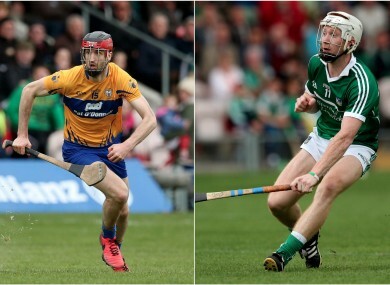 There’s now only three clubs left in the race for the Limerick senior hurling title with Patrickswell clinching a final place today while the other semi-final will be contested by Adare and Ballybrown. With Na Piarsiagh – the reigning All-Ireland club kingpins knocked out earlier this season – and now Kilmallock having exited, it means the two clubs that have lifted the last six Limerick crowns are out of the running in 2016. Patrickswell saw off Kilmallock by 1-19 to 1-15 today in the Gaelic Grounds and are back in the final for the second successive year. They were in front 1-9 to 1-8 at the break with Kevin O’Brien bagging their goal while Robbie Egan netted for Kilmallock. In the quarter-final replay at the same venue, Ballybrown saw off Ahane by 1-20 to 2-13. Kyle Loftus raised the green flag for the winners while Niall Moran and Mike Carr struck the goals for Ahane. Email “Clonlara end Cratloe's Clare senior double bid as Patrickswell book Limerick hurling final spot”. Feedback on “Clonlara end Cratloe's Clare senior double bid as Patrickswell book Limerick hurling final spot”.